Do you want to stand up if you love the Saints? Southampton Independents want to make it happen. With your help, we can. 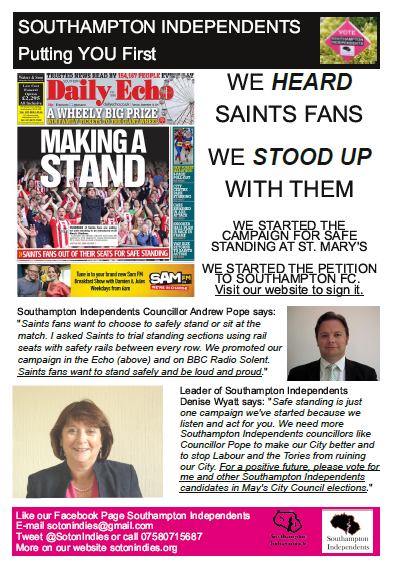 Last year, Southampton Independents (So'ton Indies) asked local Saints fans whether they wanted us to campaign for Safe Standing at St. Mary's Stadium. They did. So we have taken the lead. That's what independent councillors and residents do - stand up together to achieve a better future for our City and its residents. Andrew has also secured a venue for the demonstration of rail seating, and has agreed with the Safe Standing Roadshow to bring the demo to Southampton. Councillor Pope has now submitted a motion to the May Full Council meeting of Southampton City Council. 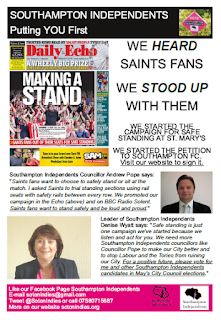 The motion, which is a call to action for the Council, is designed to garner support from Saints fans, other councillors, the owners of Southampton FC and the Government. "Due to the changes after Hillsborough, the law must be changed to allow Premier League clubs like Southampton to install Safe Standing, and to allow councils to license Safe Standing at local grounds. But we need the help of the Saints owners to make a public statement of support. I know they support it in private, from my contacts in the Safe Standing campaigns across England. But we need Saints' PUBLIC support, and they must "break ranks" from other Premier League clubs. They must take the lead in the Premier League, like Southampton Independents has with the Safe Standing campaign here in Southampton. Other clubs like Crystal Palace and Tottenham Hotspur are warming to the idea. Let's have "The Southampton Way" meaning Saints lead on the pitch as well as off the pitch. I very much hope that ALL 48 Southampton City councillors, old and new after the 3rd May elections, will support the campaign for Safe Standing at St. Mary's." "Last Friday, Andrew and I went to St. Mary's to watch the Women's World Cup Qualifier between England and Wales. We really enjoyed the atmosphere, especially all the men, women and children flying our nation's beautiful flag, the Cross of St. George. St. Mary's is a great stadium but fans want to be able to stand and shout. And to stand and shout safely. The owners of Saints should invest in fan safety and give fans what they want. Fans pay a lot of money, so they should get their say and not be ignored. At Southampton Independents, we believe that fans should have more say about what happens at their clubs, because fans are the true custodians of football clubs - not the current owners who often are just passing by. I urge all Saints fans to get behind our campaign and to sign our petition. 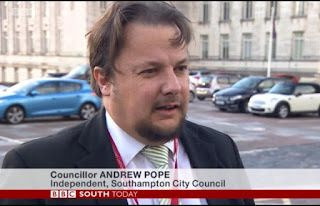 If elected to the City Council on 3rd May, I will be seconding Councillor Pope's motion. The petition, joined with the Council Motion, will help to defeat those party poopers in Government and the Premier League who want to stop Saints from having the fantastic Safe Standing areas like they have at Celtic and Borussia Dortmund. Let's create a "Saints Wall" with Safe Standing at St. Mary's!" Today (Sunday 8th April 2018), Councillor Pope has been interviewed by the Daily Echo for a new piece in the newspaper. This should appear tomorrow (Monday 9th April 2018), so keep an eye out. "At the 3rd May City Council elections, please vote for our Redbridge and Millbrook Council candidates Denise Wyatt and Ed Edworthy."